The Daily News-Sun is published Tuesday through Saturday. Subscribers can click the image above to read our e-newspaper, a digital replica of the print edition. Glendale Today is published on Wednesdays. Click the image above to read our free e-newspaper, a digital replica of the print edition. 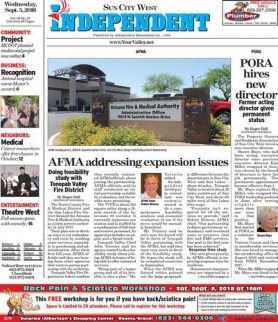 Peoria Today is published on Wednesdays. Click the image above to read our free e-newspaper, a digital replica of the print edition. 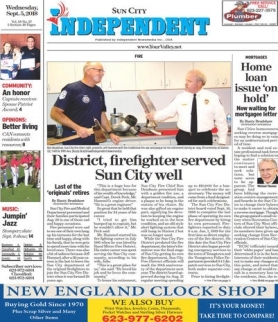 The Sun City West Independent is published on Wednesdays. Click the image above to read our free e-newspaper, a digital replica of the print edition. Surprise Today is published on Wednesdays. Click the image above to read our free e-newspaper, a digital replica of the print edition.